The Walther PP (Polizeipistole, or police pistol) series pistols are blowback-operated semi-automatic pistols, developed by the German arms manufacturer Carl Walther GmbH Sportwaffen. It features an exposed hammer, a traditional double-action trigger mechanism, a single-column magazine, and a fixed barrel that also acts as the guide rod for the recoil spring. The series includes the Walther PP, PPK, PPK/S, and PPK/E models. The Walther TPH pocket pistol is a smaller calibre pistol introduced in 1971 identical in handling and operation to the PPK. Various PP series are manufactured in Germany, France and the United States. In the past, the PPK version has been manufactured by Walther in its own factory in Germany, as well as under licenses by Manurhin in Alsace, France, Interarms in Alexandria, Virginia, US and by Smith & Wesson in Houlton, Maine, US. Since 2013, PPK and PPK/S models have been built in Fort Smith, Arkansas, at the factory of US-based subsidiary Walther Arms, Inc. The PP and the PPK were among the world's first successful double action semi-automatic pistols. They are still manufactured by Walther and have been widely copied. The design inspired other pistols, among them the Soviet Makarov, the Hungarian FEG PA-63, the Polish P-64, the American Accu-Tek AT-380 II, and the Argentinian Bersa Thunder 380. The PP and PPK were both popular with European police and civilians for being reliable and concealable. During World War II, they were issued to the German military, including the Luftwaffe, as well as the police. The original PP (Polizeipistole) was released in 1929. It was designed for police use and was used by police forces in Europe in the 1930s and later. The semi-automatic pistol operated using a simple blowback action. The PP was designed with several safety features, some of them innovative, including an automatic hammer block, a combination safety/decocker and a loaded chamber indicator. The most common variant is the Walther PPK, a smaller version of the PP with a shorter grip, barrel and frame, and reduced magazine capacity. A new, two-piece wrap-around grip panel construction was used to conceal the exposed back strap. The smaller size made it more concealable than the original PP and hence better suited to plainclothes or undercover work. It was released in 1930. "PPK" is an abbreviation for Polizeipistole Kriminalmodell (detective police pistol). While it's often thought to be "kurz" (German: short) referring to the police pistol with shorter barrel and frame, the manufacturer's selection of the name "Kriminal" appears in early original advertising brochures from Walther and the 1937 GECO German catalog. Adolf Hitler shot and killed himself with his PPK (.32 ACP/7.65mm) in the Führerbunker in Berlin. South Korean dictator Park Chung-hee was shot and killed by Kim Jae-gyu, using the Walther PPK. The Walther PPK pistol is famous as fictional secret agent James Bond's gun in many of the films and novels: Ian Fleming's choice of the Walther PPK directly influenced its popularity and its notoriety. Fleming had given Bond a .25 Beretta 418 pistol in early novels, but switched to the PPK in Dr. No on the advice of firearms expert Geoffrey Boothroyd, though the actual guns carried by Bond and Felix Leiter in the film were, in fact, Walther PPs. Actor Jack Lord was presented with a gold plated one with ivory handgrips. Singer Elvis Presley owned a silver-finish PPK, inscribed "TCB" ("taking care of business"). The PPK/S was developed following the enactment of the Gun Control Act of 1968 (GCA68) in the United States, the pistol's largest market. One of the provisions of GCA68 banned the importation of pistols and revolvers not meeting certain requirements of length, weight, and other "sporting" features into the United States. The PPK failed the "Import Points" test of the GCA68 by a single point. Walther addressed this situation by combining the PP's frame with the PPK's barrel and slide to create a pistol that weighed slightly more than the PPK. The additional ounce or two of weight of the PPK/S compared to the PPK was sufficient to provide the extra needed import points. Because United States law allowed domestic production (as opposed to importation) of the PPK, manufacture began under license in the U.S. in 1983; this version was distributed by Interarms. The version currently manufactured by Walther Arms in Fort Smith, Arkansas has been modified (by Smith & Wesson) by incorporating a longer grip tang (S&W calls it "extended beaver tail"), better protecting the shooter from slide bite, i.e., the rearward-traveling slide's pinching the web between the index finger and thumb of the firing hand, which could be a problem with the original design for people with larger hands or an improper grip, especially when using "hotter" cartridge loads. The PPK/S is made of stainless steel. The PPK/S magazine holds one additional round, in both calibers. The PPK/S and the PPK are offered in the following calibers: .32 ACP (with capacities of 8 for PPK/S and 7 for PPK); or .380 ACP (PPK/S: 7; PPK: 6). The PPK/S is also offered in .22 LR with capacity of 10 rounds. In the 1960s, Walther produced the PPK-L, which was a light-weight variant of the PPK. The PPK-L differed from the standard, all steel PPK in that it had an aluminium alloy frame. These were only chambered in 7.65mm Browning (.32 ACP) and .22 LR because of the increase in felt recoil from the lighter weight of the gun. All other features of the postwar production PPK (brown plastic grips with Walther banner, high polished blue finish, lanyard loop, loaded chamber indicator, 7+1 magazine capacity and overall length) were the same on the PPK-L.
First marketed in 1972, this was an all-steel variant of the PP chambered for the 9×18mm Ultra cartridge. Designed as a police service pistol, it was a blowback operated, double-action pistol with an external slide-stop lever and a firing-pin safety. A manual decocker lever was on the left side of the slide; when pushed down, it locked the firing pin and released the hammer. When the 9×19mm Parabellum was chosen as the standard service round by most of the German police forces, the experimental 9mm Ultra round fell into disuse. Only about 2,000 PP Super pistols were sold to German police forces in the 1970s, and lack of sales caused Walther to withdraw the PP Super from their catalogue in 1979. At the 2000 Internationale Waffen-Ausstellung (IWA—International Weapons Exhibition) in Nuremberg, Walther announced a new PPK variant designated as the PPK/E. The PPK/E resembles the PPK/S and has a blue steel finish; it is manufactured under license by FEG in Hungary. Despite the resemblance between the two, certain PP-PPK-PPK/S parts, such as magazines, are not interchangeable with the PPK/E. Official factory photographs do not refer to the pistol's Hungarian origins. Instead, the traditional Walther legend ("Carl Walther Waffenfabrik Ulm/Do.") is stamped on the left side of the slide. The PPK/E is offered in .22 LR, .32 ACP, and .380 ACP calibers. Walther's original factory was located in Zella-Mehlis in the "Land" (state) of Thuringia. As that part of Germany was occupied by the Soviet Union following World War II, Walther fled to West Germany, where they established a new factory in Ulm. For several years following the war, the Allied powers forbade any manufacture of weapons in Germany. As a result, in 1952, Walther licensed production of the PP series pistols to a French company, Manufacture de Machines du Haut-Rhin, also known as Manurhin. Manurhin made the parts but the pistol was assembled either at St. Etienne arsenal (marked "Made in France") or by Walther in Ulm (marked "Made in West Germany" and having German proof-marks). The French company continued to manufacture the PP series until 1986. In 1978, Ranger Manufacturing of Gadsden, Alabama was licensed to manufacture the PPK and PPK/S; this version was distributed by Interarms of Alexandria, Virginia. Ranger made versions of the PPK/S in both blued and stainless steel and chambered in .380 ACP and only made copies chambered in .32 ACP from 1997 to 1999. This license was eventually canceled in 1999. Walther USA briefly made PPKs and PPK/Ss in Springfield, Massachusetts. From 2002, Smith & Wesson (S&W) began manufacturing the PPK and PPK/S under license at their plant in Houlton, Maine until 2013. In February 2009, S&W issued a recall for PPKs it manufactured for a defect in the hammer block safety. In 2018 Walther Arms began producing them again at their new US manufacturing plant in Fort Smith, Arkansas and new ones are being shipped as of March 2019. Switzerland: PPK variant. Used by pilots of the Swiss Air Force and various police forces. Turkey: A close copy Kirikkale in 7.65 and 9mm was produced locally after World War II. United States: Produced locally and used by various police forces. 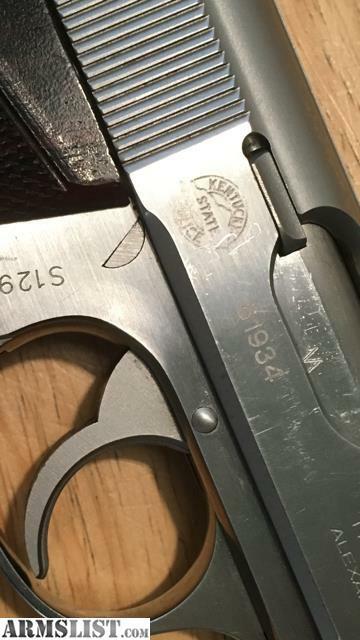 Kentucky State Police issued the stainless PPK/S as a backup gun and each pistol had the agency logo engraved on the slide. ^ a b c d e f Bishop, Chris (2002). The Encyclopedia of Weapons of World War II. Sterling Publishing Company, Inc. ISBN 978-1-58663-762-0. ^ Katz, Sam (24 Mar 1988). Arab Armies of the Middle East Wars (2). Men-at-Arms 128. Osprey Publishing. p. 47. ISBN 9780850458008. ^ "About Walther". Walther Arms. Retrieved 5 June 2014. ^ a b c d "Walther PP and PPK self-loading pistols (Germany)". Jane's Infantry Weapons. Janes.com. 28 February 2012. Archived from the original on 22 March 2011. Retrieved 7 November 2012. ^ "Customer Support". Walther America. Archived from the original on 2009-11-17. Retrieved 7 November 2012. ^ "About Walther". Retrieved 2 June 2018. ^ "Walther PPK". Retrieved 2 June 2018. ^ Fischer (2008) p. 47 "...Günsche stated he entered the study to inspect the bodies, and observed Hitler ...sat...sunken over, with blood dripping out of his right temple. He had shot himself with his own pistol, a PPK 7.65." ^ Hartink, A. E. (1996). The Complete Encyclopedia of Pistols and Revolvers. Lisse: Rebo. p. 368. ISBN 978-9-03661-510-5. ^ a b "James Bond's Walther PPK". CIA Museum. 8 November 2007. Archived from the original on 9 January 2008. Retrieved 15 January 2015. ^ "The Walther PPK of Ian Fleming's James Bond". Retrieved February 25, 2019. ^ "Time Out: The Guns of James Bond". BBC. 16 September 1964. Retrieved 16 January 2015. ^ Macintyre, Ben (2 February 2012). For Your Eyes Only: Ian Fleming and James Bond. A&C Black. p. 114. ISBN 978-1-4088-3064-2. ^ "Entertainment The King of all auctions". BBC. 6 September 1999. Retrieved 16 January 2015. ^ a b "PPK/S Pistol .380ACP". Smith & Wesson. Archived from the original on September 11, 2008. ^ "Modern Firearms - Walther PP Super". World.guns.ru. Archived from the original on 2010-09-02. Retrieved 7 November 2012. ^ "IWA2000". CyberShooters.org. Retrieved 4 May 2008. ^ "If Reliability Counts...The New Walther PPK/E" (PDF). Carl Walther Sportwaffen GmbH. Retrieved 4 May 2008. ^ "Walther PPK PPKS Safety Recall". Smith & Wesson. Archived from the original on 4 November 2012. Retrieved 7 November 2012. ^ "Walther PPK Pistol". Compound Bow. Retrieved 9 January 2019. ^ Thompson, Leroy; MacSwan, Ken (1985). Uniforms of the Soldiers of Fortune. Poole: Blandford Press. pp. 111–112. ISBN 9780713713282. ^ a b c d e f g h i j k l Jones, Richard D., ed. (2009). Jane's Infantry Weapons 2009/2010 (35th ed.). Jane's Information Group. ISBN 978-0-7106-2869-5. ^ "The use of police firearms in Denmark" (PDF). Politi.dk. Retrieved 21 February 2015. ^ a b c d e f Popenker, Maxim. "Walther PP & PPK". Modern Firearms. Retrieved 7 November 2012. ^ "Kopassus & Kopaska - Specijalne Postrojbe Republike Indonezije". Hrvatski vojnik (in Croatian). Archived from the original on 22 August 2010. Retrieved 12 June 2010. ^ "Walther PP, Swedish Contract". Panchogun.com. Retrieved 7 November 2012. ^ "Jakt & Jägare". Jaktojagare.se. 25 January 2008. Archived from the original on 2016-10-18. Retrieved 16 October 2016. ^ Wiener, Friedrich (1987). The armies of the NATO nations: Organization, concept of war, weapons and equipment. Truppendienst Handbooks Volume 3. Vienna: Herold Publishers. p. 428. ^ "Kentucky State Police marked PPK/S". Amazon S3. Retrieved 8 December 2017. Fischer, Thomas (2008). Soldiers of the Leibstandarte. Winnipeg, Canada: J.J. Fedorowicz Publishing, Inc. ISBN 978-0-921991-91-5. Hogg, Ian V. (1979). Guns and How They Work. New York: Everest House. ISBN 0-89696-023-4. Josserand, M. H.; Stevenson, J. A. (1972). Pistols, Revolvers, and Ammunition. New York: Bonanza Books (A division of Crown Publishers, Inc.). ISBN 0-517-16516-3. Henrotin, Gerard (2017). Walther PP pistol explained. Belgium: HLebooks.com. 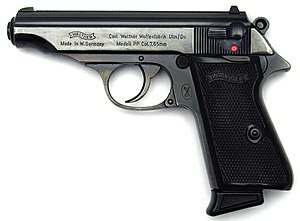 Wikimedia Commons has media related to Walther PPK. This page was last edited on 13 April 2019, at 15:07 (UTC).